Steel cooking pans that combine the best of cast iron and French steel pans are going to be a game changer in your kitchen. They even might be the last pan you ever buy. The Australian-made AUS-ION steel pans are created from one seamless piece of iron (steel). The dense material cooks similarly to cast iron, but is lighter and thinner. The result is a hard-core pan that heats evenly and maneuvers easily. 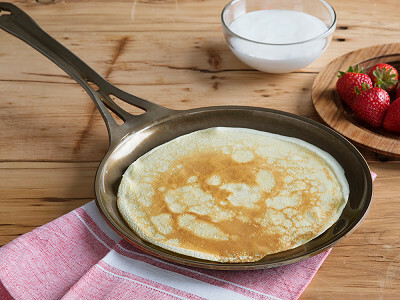 The durable pans are built to last a lifetime—which is why SOLIDTEKNICS backs them with a multi-century warranty. Founder Mark Henry’s design features a longer, vented handle that stays relatively cool and is easy to control. And, each pan is pre-seasoned, too. Clean it like cast iron—so no soap or dishwasher—and it will continue to season with each use. With a guarantee to last a lifetime, if not more, these hard-core pans will prove to be the new workhorse in your kitchen. 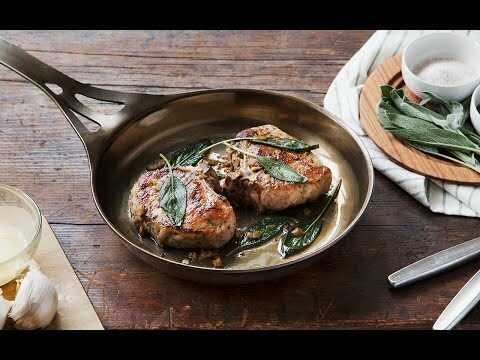 What's the difference between the Steel and Satin Skillets? The low carbon steel or wrought iron is the pan's material and satin is the finish. The satin finish is a shot peened finish. Shot peening is a cold work process used to finish metal parts to prevent fatigue and stress corrosion failures and prolong product life for the pan. In shot peening, small spherical shot bombards the surface of the part to be finished which makes seasoning a very efficient process. The Maker then applies one layer of rice bran oil to the entire pan. The smooth finish has not been shot peened, though non-GMO organic rice bran oil has still been applied. 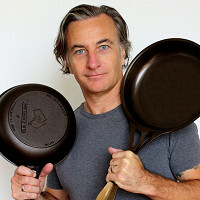 Hi, I'm Mark Henry, and will be here today to answer your questions about our seamless and rivet-free AUS-ION Cookware. We're excited to share more about our lightweight pans because they heat quickly and have a vented section that keeps the handle cool. We make these pans in Australia and expect them to last for generations. The pans being made from one piece of steel was one of the first things we all were amazed by, what was the inspiration for the design? @Mike Well being an avid amateur chef and career engineer, I always am looking at creating something both functional and beautiful -- and oftentimes 'groundbreaking' ... Plus being able to forge our pans in one piece makes it much more hygienic. Because it's never been done before adds to the incentive and the challenge!!! What aspects of development were geared toward making these pans last for a lifetime? @Mike I was inspired by some of the old pans my relatives and friends had in their pantries -- some of which had been passed down for several generations. I suppose that and my own passion to make something that really lasts incentified me to see if could not only create an heirloom but also to help revitalize innovation in the Australian cookware industry. I am also really against creating short term products that end up in landfills. Can your pans be used with induction cooktops? @Elise Hi Elise, these pans work really well on an induction cooktop because they are solid steel. The thick metal will hold heat really well between an electric burner cycling on and off too! Are there any plans for a larger skillet? My Cast Iron 14 inch is so heavy, but it fills a need for my large family. 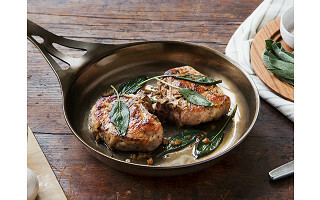 @Marty Hi Marty, the 10.25in / 26cm version we have here is the largest steel skillet available now, but it weighs half as much as a similarly sized cast iron pan. Our testers loved the long handle, it really helps with maneuvering a full pan. Will these work on ceramic cooktops? @Lynne Hi Lynne, these pans are compatible with all rangetop heat sources. The solid steel these pans are made from is perfect for induction, safe for glass or ceramic tops, oven-proof, and tough enough to take camping and use over open fire pits or in high-temp wood-fired ovens. Just make sure to follow the instructions for seasoning! @Kristin Hi Kristin, definitely! Since the pan is formed steel, it can go right from the stove to an oven. The vented handle will keep it cool on the stove, but you should be careful and use mitts when removing it from the oven after cooking. Can the pans be used in conventional ovens? @Carmen Since the pan is formed steel, it can go right from the stove to an oven. The vented handle will keep it cool on the stove, but you should be careful and use mitts when removing it from the oven after cooking. Can you use these pans over an open flame like cast iron? @Sarah Definitely. AUS-ION pans work with any heat source, including induction. Being solid dense sheet iron (not cast) they heat very efficiently, and evenly. They are also safe on any surface, including ceramic/glass tops (with the seasoned layer they're considerably softer than stainless steel, and not abrasive like enameled cast iron). Perfect in any oven (except microwave! ), and also tough enough for camp cooking on open flame.....for many generations. Guaranteed. @Sarah Hi Sarah, since these pans are made from solid steel, they can handle all kinds of heat sources! They're tough enough to take camping and use over open fire pits, or even in high-temp wood-fired ovens. Just make sure you use proper high temp mitts! Will there be lids made to fit? Or is there some other option for lids? @Guest No plans to introduce lids at this stage. Hello! Are these pans non-stick (like Teflon)? @Diane Yes, like all cast iron or steel pans, they all need seasoning to develop the best nonstick and avoid rust. Some iron/steel pans, like ours, come pre-seasoned, but it is only ever a light pre-seasoning to avoid rust. Much more is required to develop the nonstick. Like our instructions say, there is a whole range of seasoning you can do, from old school 'just start cooking fatty foods' through to 6 sessions of oven seasoning plus chef stove-top seasoning. The good news it is all way easier than it looks at first sight, we've got 10,000 happy pan owners all doing it, and millions all around the world have been doing it for centuries. 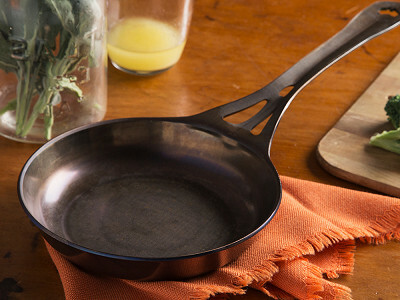 Once the reports about synthetic-coated cookware started coming from the independent scientists, many started switching back to iron/steel because it is the only safe and healthy way to achieve nonstick. It takes a little learning, but well worth the effort! The description said it is made with "iron(steel)". What does that mean? Does it rust? Is it coated? What happens if it is put in the dishwasher? @Meryl The pans should be treated and seasoned the same way as cast iron. They come with a ready-to-cook light seasoning from the factory, but will be further seasoned with to establish a non-stick coating. Regular oiling will help maintain that coating and keep the pan in great condition. If not dried properly after cleaning they might develop a bit of surface rust, but they can easily be reconditioned back to near new with a bit of elbow grease and steel wool. We found that a few moments back on the stove after washing is a great way of drying them quickly. @Meryl Our skillets are very low carbon mild steel, not high carbon steel. • The pans are ready to cook, because they aren't coated in toxic rust inhibitors and are pre-seasoned ready for safe cooking (as stated on the hang tag). Very few manufacturers add the expensive step of pre-seasoning, and most are coated in nasties that need extensive scrubbing off before seasoning. I think it's a bad use of a chef's time! • However to reach max nonstick we always recommend that the seasoning needs to be built up (in oven and through more cooking), a lot like cast iron or woks, and exactly like French steel pans. • YOU can wash them in dishwasher but we don't recommend and you need to treat them with a light coat of oil immediately afterwards otherwise they might rust. Good news is you can't destroy the pan. If there's a real disaster you can scrape/scour them back to bare metal and start the seasoning again following our instructions. Once well-seasoned the cleanup and seasoning maintenance will be very easy, and almost zero. Hi! 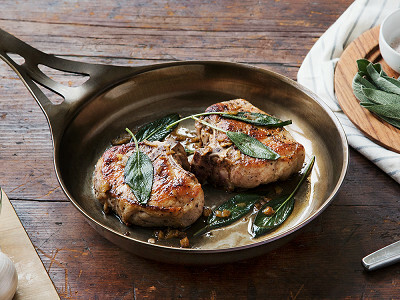 I love the idea of a cast iron like pan without the weight! Are there lids to fit for purchase, or will there be in the future? @Mark I'll be really interested in these when/if lids are available. Cast iron is my favorite, but my older, arthritic wrists would really appreciate something more lightweight. Thanks for inventing these, and I look forward to doing business with you in the future. What is the best way to clean the AUS-ION skillet? @Julie Hi Julie, the care instructions are very similar to maintaining cast iron pans. Mark actually made a video demonstrating the best cleaning technique. But a wood spatula and hot water are a good way to clean the pans after use. A brush can be used for some harder scrubbing, but try and avoid soap since it will wear down the seasoned coating. It's very easy to build the seasoning back up after an aggressive cleaning though! Can this pan be used on a glass electric stove top? @Pete as mentioned already, AUS-ION pans work with any heat source, including induction. Being solid dense sheet iron (not cast) they heat very efficiently, and evenly. They are also safe on any surface, including ceramic/glass tops (with the seasoned layer they're considerably softer than stainless steel, and not abrasive like enameled cast iron). Perfect in any oven (except microwave! ), and also tough enough for camp cooking on open flame.....for many generations. Guaranteed. @mark are these pans induction ready? HI @Kate -- yes -- answered this a couple of times -- all good on all surfaces -- see my answer above. Thanks for your question. Do you have any plans for a Dutch oven for this collection? Is it not possible to stamp such a deep pan? 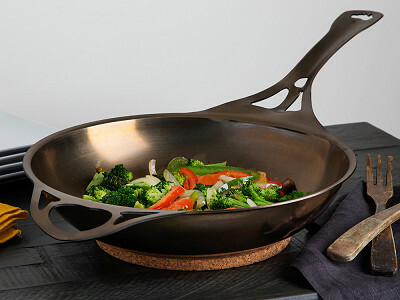 I like the short handle designed for the wok- very pretty. I also hope you will consider manufacturing lids for these. @Meg Thanks for your inquiry -- we are always innovating and testing new concepts and have a lot of different possible plans on the drawing board. Our AUS-ION line is formed from a single sheet of iron in a patent pending new process so there is continuous R&D. We will definitely keep you posted. No lids planned at this stage. PSA - Hi everyone! There's been such a great response to the launch we're nearly out of stock. The Grommet team is working to make additional inventory available, check back later today! Hi, I have a glass topped electric stove. The manufacturer says that I can't use cast iron pans or enameled pans. Can this pan be used on stoves with a glass top? @Barbara the AUS-ION pans are no problem for glass/ceramic cooktops. It's actually softer than stainless steel. So, no problem using AUS-ION steel pans on glass/ceramic stove tops in terms of scratching, and they heat very efficiently and evenly on any heat source, including infra-red and induction. @Mark I no longer use my iron pans because they add iron to the foods being cooked. I'm not supposed to have added iron in my diet. So, from the descriptions, I can't tell if there is iron in these pans, or some combination of sheet iron & stainless or what? @Margaret Technically our pans are 'steel', being a very low carbon mild steel, just like the French steel pans. But the iron % is so high that we also call them iron like the French do. We use both terms because 'steel pan' is used by the Americans and Aussies, and 'iron pan' is used by French. The composition is almost identical to cast iron pans, but the properties are very different because wrought sheet is tough and malleable, and cast iron is slightly porous and brittle. Too complicated to explain in detail, but the key is that we use the very best of clean Australian materials as opposed to many of the lesser grade materials used in some pans from China -- we are all about the quality. We've had a ton of interest in the pans today and sold out of our initial stock. We're working to get more in stock later today. Please try again in a couple hours! I keep kosher. What do you use for preseasoning the pan? @Cliff our pans are seasoned with rice bran oil. @Steve Sorry Steve, but we're focused on growing The Grommet within the USA for now. We're hoping to expand into Canada in the future, but in most cases international shipping is too cost prohibitive to make sense. I was hoping someone could tell me more about the lifetime warranty that comes with these pans. @reena thanks for your inquiry -- we love the fact that we have a product that is truly made to last-- we call it "multi-century"! It's actually a standard lifetime warranty in law (for materials and manufacturing defects ), but we call it a multi-century warranty because it's obvious that our seamless one piece pans made from tough Australian steel will last for many hundreds of years. Advertised as "starting at $79.95. Only option is $129.95. False advertising. Not buying it. Grommet should send me on free for the false offer. Hi Amron, the $79.95 pans are completely different from the $129.95 pan. We are also sold out and are working to get them back in stock. 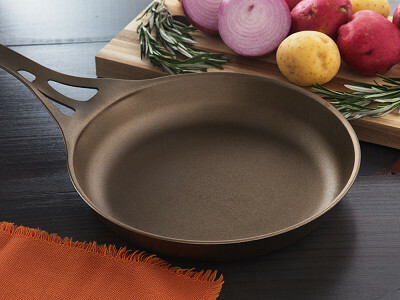 Since the pans are not available will you honor the 20%off (Happy National Thank You Day) when they are available? Hi Paula, unfortunately the discount only applies to available items. You might be able to order one before they go out of stock.